The live oak (Quercus virginiana) is an integral part of the Southeastern United States coastal area landscape. Its characteristic massive spread, with large horizontal branches reaching outward almost as far as the total tree reaches upward, makes this tree an easily identifiable species. Often, those gigantic branches are draped with parasitic Spanish moss. 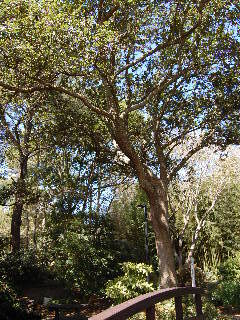 Another characteristic aiding in the identification of the live oak is its year-round green leaves. While most of the oaks are true deciduous trees, shedding leaves in the fall and winter and producing new ones in the spring, the live oak holds its green leaves into the spring of the year when new leaves start to emerge. Thus, it appears to many observers that the tree is evergreen, or “live”, throughout the year. The growth habit of those large, and often somewhat twisted, tree limbs makes the lumber of live oak less desirable for oak flooring but more desirable for strong short beams which are useful in ship building. The tree itself is rather undemanding of growing conditions, as witnessed by the fact that most live oaks are found growing with the utmost health and vigor in the nutrition-poor sand of those coastal areas. Its growth rate is rather slow to moderate (typical of most oaks), but this slow growth rate results in the dense and strong wood fibers that oaks are famous for. Also, the live oaks are extremely long-lived, with lifespans greatly exceeding 100 years being very common. 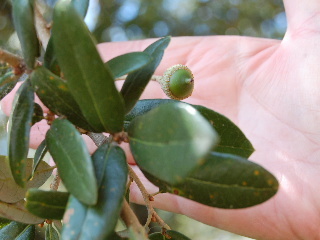 Leaves of the live oak are dark green and glossy on the upper surfaces and paler and somewhat hairy on the undersides. The outer edges of the leaves are not lobed or indented at all, but have smooth edges and often a slightly pointed tip. Leaves are generally from 2 to 4 or 5 inches in length and elliptical or oblong in shape. The acorns (seeds) of the live oak trees are not very big--usually less than an inch in length--but are a favored food of squirrels and wild birds. So, while the live oak does have some economic value in the production of useable tough wooden products like ship beams and tool handles, its greater impact seems to be as a living windbreak along coastal areas and as a remarkably beautiful and distinctive addition to the natural landscape.